Cora Amalia, the president of the municipality, affirmed the stories I’d heard for a while. There was a “lost” Maya city in the nearby jungle that rivals Tikal in Guatemala and has a pyramid larger than the one at Palenque in the state of Campeche. Well, the dry season came. We applied for and got the INAH permit and set off on the adventure – seven of us in Luis’ Suburban. Our crew consisted of Luis Tellez, professional guide and photographer and his wife Leti, myself and my significant other Susy, two expats that lived locally and had done some research on the city, and don Millon a 90-year-old farmer who had worked in the area as a chiclero, one of the men that harvested the chicle for making chewing gum, and who had visited the ruins in his youth. We located the turn-off from the paved road that led to a small Maya community of a few traditional thatched huts. We presented our permit to a Maya woman who was the designated caretaker. She read the permit and then herded her family out to be photographed by us. After a few miles of torn up earth that had exposed many pottery shards and with the smell of ripped-up vegetation in our nostrils, we came to an intersection in the jungle freeway. “Turn left,” said don Millon. To the right we could see heavy equipment and men working in the distance. We drove about three quarters of a mile dodging large rocks, tree trunks and limbs until the road became so bad we could go no further. We had passed a turnoff a little way back and decided to turn around and take it. It was a primitive road that looked as if it hadn’t been traveled for ages. “Yes, I think this is it. It looks familiar,” said our navigator, don Millon. After about a half a mile of traversing a terrain of ruts and rocks, we decided to get out and look around. I walked further down the road with don Millon. He told me that he had been on this road many times in years past. “One night I was walking on this road and saw two ‘tigres' ” he said. Tigre (tiger) is the local word for any large cat – in this case probably jaguar. Since it was daylight I thought we would be safe from attack by one of the big cats. We wandered for awhile towards what I hoped was the “lost” city. Then we heard the women calling us. We backtracked to meet them and were told that Luis had had a flat tire and his jack had broken. Scott, the expat, had hiked back to see if he could get help from the work crew. The tire was finally removed with a borrowed jack and the spare put on. We decided we should not try to go any further, so we headed back towards “civilization.” We passed the turnoff to where the crews were working and went a couple of miles more when another tire blew. Three tires weren't going to get us back. Luis and Scott headed back to ask the workers for help. They returned with a guy in a beat up pickup truck loaded with empty diesel fuel drums. He said he would take us into town to find a tire. We remembered that the manager of Rancho Encantado, the resort where we were staying, also had an old model Suburban, so we headed there. It seemed like we were going 90 miles an hour on the way back. 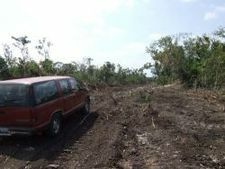 Don Millon and I were in the back of the pickup bouncing into the air every time we hit a pothole along with several oil drums, and ducking to avoid overhanging branches. We made it to the resort and fortunately the manager did have a spare which the driver of the pickup took back to Scott and Luis who were still waiting with the vehicle in the jungle. Well, some months have passed and it’s rainy season again and the “lost city” still remains lost. But I have made a vow to get back there again, on one tire, two tires, or literally flying by the seat of my pants, if I have to. Local tourism authorities assured me that Xcabal (pronounced ish-kah-bal and the name of the site) will be open to the public this year. Having been down that road, I'm not holding my breath. ✓ Subscribe to YourLifeisaTrip.com and be notified when new articles appear, click here. It's free, it's fun, and it keeps you on the cutting edge of what our writers are thinking.